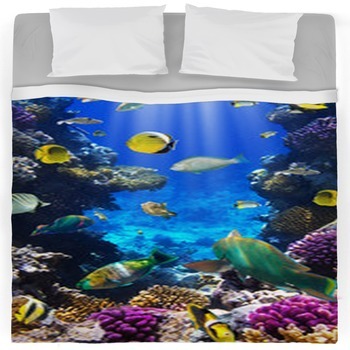 A custom duvet or comforter with a view of a school of bright yellow tropical fish with vertical brown stripes and bold blue eyes backlit by a bright blue ocean and coral reef can be just what is needed to add a touch of relaxation to any bedroom with an ocean or tropical theme. 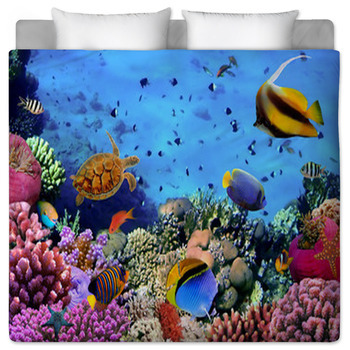 To add a bit of scenery to the mix, a couple of lush green tropical islands in the backdrop of an underwater view of a fish filled coral reef makes for amazing tropical fish inspired bedding with a special touch of the tropics from top to bottom. 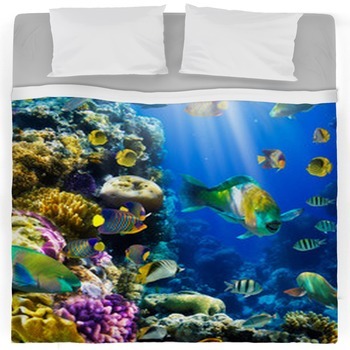 Tropical fish have a beauty all their own gliding through clear shallow seas amongst a colorful landscape of coral reef providing a scene everyone can enjoy and only a handful of vacation spots can provide, making them very popular tourist destinations. 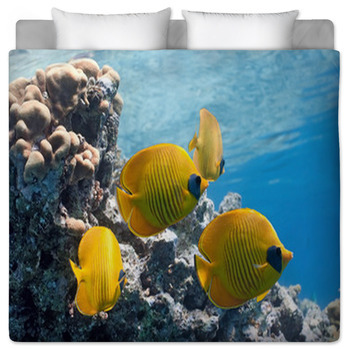 Tropical fish are loved by amateurs and professional reef divers alike for their bright patterns and rare beauty and are becoming even more rare and treasured with each passing year. 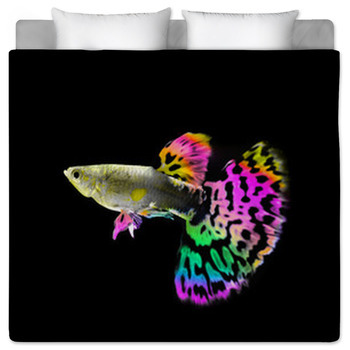 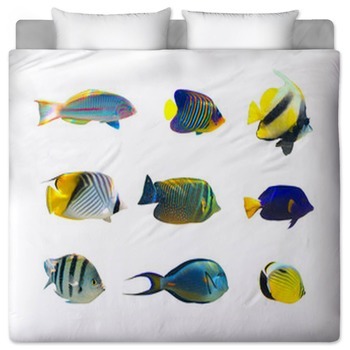 A photographic tropical fish bedspread from VisionBedding can bring home the unique and wonderful feel to a bedroom that only tropical fish can provide. 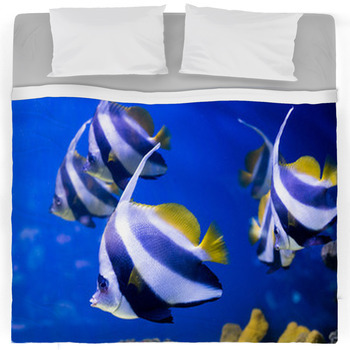 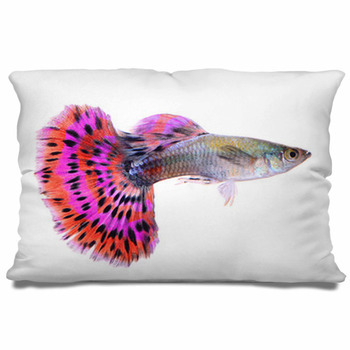 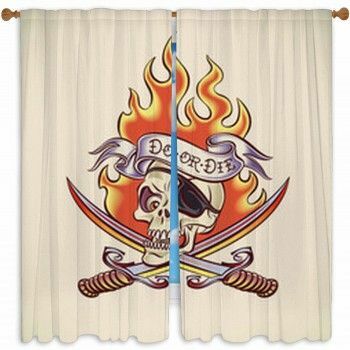 You can also choose tropical fish themed decor such as wall murals, rugs, and even baby bedding. 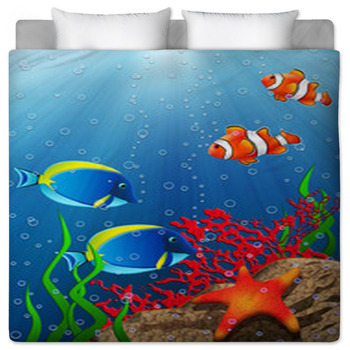 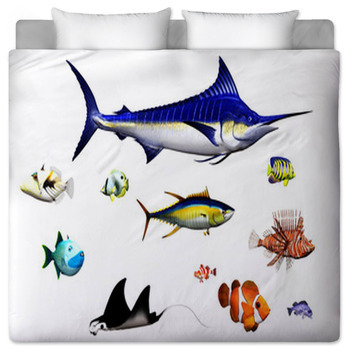 If its the fish that need to take center stage on a unique duvet, than an assortment of fish from the tropical regions including a powerful swordfish, an all popular orange and white striped clown fish, and a sweeping sting ray make for a tropical bedding set that is truly one of a kind and any fish enthusiast can enjoy. 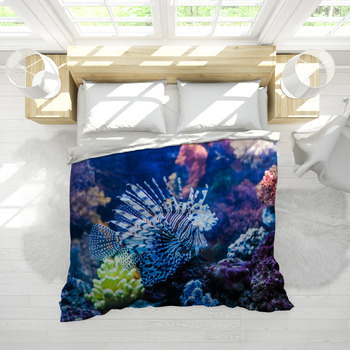 To bring a colorful feel to a tropical themed room nothing is better than bedding filled with fish of almost every color and beautiful patterns it will make you want to dive into your bedding just like you were going snorkeling. 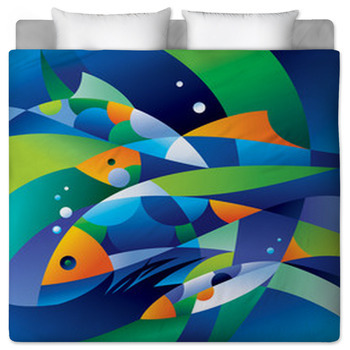 A wild and intermingled school of fish jam packed across a custom comforter and from every size and variety brings a unique style to a girls room that she is sure to enjoy while a brilliant yellow and orange tropical fish wearing a snorkel and goggles with a big bright eyed smile will add a special feeling to any children's room that needs a playful touch with a tropical theme.